Lookie here! I created a thread for my contest program development! I don't know what I'm going to create yet, but will soon. I've completed my land submission for CC20! 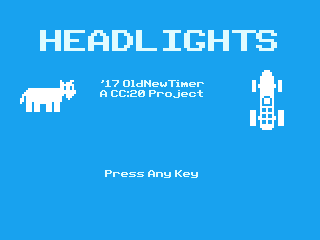 It is entitled "Headlights", a game in which you try to not hit the "deer in the headlights". Every time you pass 10 deer, you gain a point. Every time you hit a deer, the deer gets a point. It doesn't really have an end goal, but it's fun to see who can get the highest score! After seeing dankcalculatorbro's submission for the first time, the two are very similar . But you know what they say, Great Minds Think Alike! looking pretty good! I would recommend however, making the car change lanes smoothly. Also, I would make the deer move in from the top of the screen and move out of the bottom. That is, if ice (which I am guessing you are using) supports clipped sprites. The problem with sprites in ICE is that they can't be added to the clip, so I can't make them do that . Anyways, Headlights has been released into the Cemetech Archives ! I've been busily working on my CC:20 water entry for the past couple of days and have got a pretty good base established (It sorta works ). The game is called "Escape The Buoy" and is made in ICE. The goal will be to escape from a buoy you are stranded on using the resources you find. Oh, uh... I like, um... that... if you switch to Geico you could save a ton of money on car insurance! Because that is always the correct answer! All jokes aside, this does actually look very promising! (based off what I can see in the gif) You have me a little worried, this may look too good. P.S. I think you should name the boat "Boaty-McBoatFace"
These are stunning graphics, well done! I really like the story, too. I'm doing this design because it has a solar panel (which is a major part of the game). I tried to make a sea entry containing Boaty-McBoatFace, but it was too cringy and triggering to make, so it went to the never-to-be-released-ever-to-the-public archives (AKA Recycling Bin) . Escape The Buoy has been accepted into the archives! 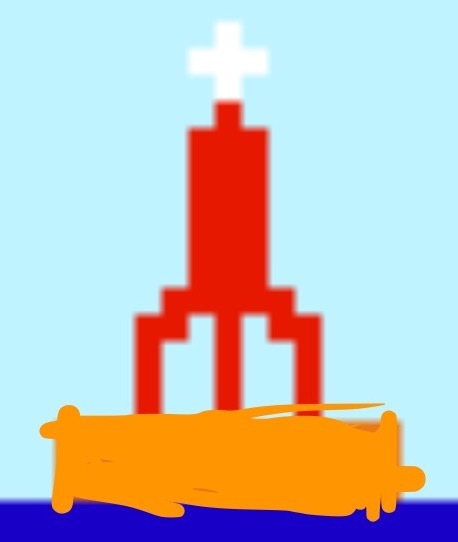 If you don't know what it is, it's a game in which you try to escape a buoy with the items you find. Anyways, that's all for now! I'm going to Florida tomorrow for vacation! But before I go, I'll give you all an update on my air entry. I have just begun working on in and all I really have done is the graphics. 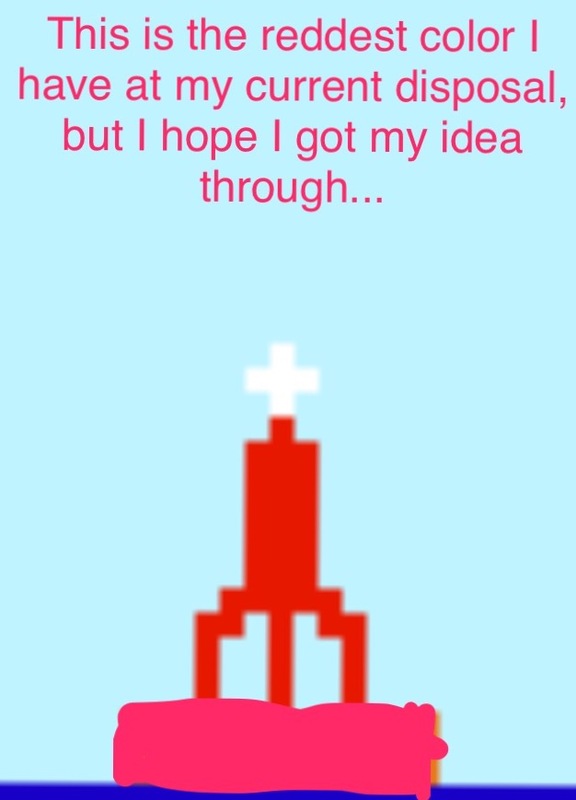 The game is probably going to be something with Galaga-esc style, but I'm not sure yet. That's all I got for now! Please let me know how I can improve the graphics at all! EDIT: After staring at the image for a while, I noticed it kind of looks like the water is moving! What an illusion! I'm going to Florida tomorrow for vacation! Introducing my Rushed-Code-Bug-Filled-Patched-Together-Excuse-For-A-Game program! It's called "The Plain Plane Game". It's unfinished right now, but I got it at pretty good start. Look at dem amazin graphics! That's all for now! Hopefully I'll add enemies and obstacles soon! One question: is it shooting backwards pencils? It is already looking better than mine, which I feel I've said a lot lately about your things. From what I've seen of your programs, I feel that they have a much better system of scoring/objectives. Every decision you make effects the game's outcome, which makes it more fun and interesting. All of our games have their certain strengths and weaknesses. 1) I'm laughing so hard. 2) Yes. I am not a huge fan of *most* action games because I feel like there are ways of cheesing them, and I'd much rather spend my time writing and playing games that require more than two brain cells. I also feel like scoring systems and objectives keep a player going, even if it is a little grindy. I have started on enemy spawning and hit detection. The missile texture is also redesigned so it doesn't look like a pencil. But hey! At least it's not like this anymore! Haha; love the second screenshot. Keep up the good work! You could probably solve flickering by drawing to the offscreen buffer. The missile texture is also redesigned so it doesn't look like a pencil. Now it looks like a boat. There are 124 users online: 1 member and 123 guests. © Copyright 2000-2019 Cemetech & Christopher Mitchell :: Page Execution Time: 0.201550 seconds.